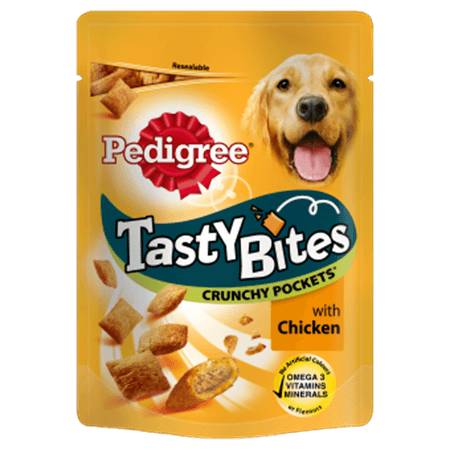 Pedigree Tasty Bites Crunchy Pockets with Chicken is rated 5.0 out of 5 by 1. Toy dogs (2-3kg), feed up to 3 pockets per day. Small dogs (4-9kg), feed up to 5 pockets per day. Medium dogs (10-15kg), feed up to 11 pockets per day. Medium-Large dogs (16-24kg), feed up to 15 pockets per day. Large dogs (25kg+), feed up to 22 pockets per day. Please reduce main meal accordingly. To maintain quality and freshness after opening, use the reseal device. Fresh drinking water should always be available.